Not Always One's Happiest Days! The Sea-King's cabin was crammed with treasure like a Christmas-stocking: there were strings of pearls and shining shells,shields and spears of beaten gold,and strange old figure-heads: there were bales of silk, barrels of rum, and jewels by the chestful. In the middle sat the King himself, great arms folded over an embroidered satin waistcoat. 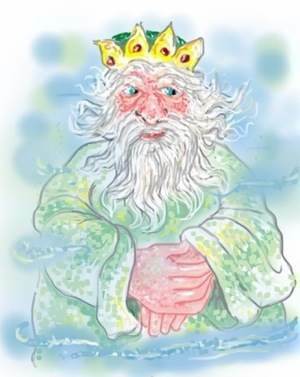 His beard, white and soft as dandelion-feathers, floated all about him, and his crown was studded with rubies as big as cricket-balls. Without a word he sat there,gazing steadily at Esmeralda with wise green eyes, and waited for her to speak. When she had told him everything, the King began to smile. He knew how conceited she was, and thought a week or two would teach poor Esmeralda a lesson;so he clapped his jewelled hands for the guard. In came the lobster to punch her passport with his pincers,and Esmeralda was free to go! She bowed before the King( she couldn't curtsey, because of her tail) and wondered what he was laughing at: but soon, in her empty-headed way, forgot all about him. Oh,how excited she was! She stood for a moment on tip-tail: then, without stopping to look back at her underwater home,she pushed hard against the sea-floor and sprang upwards like a new rubber ball. Up and up and up she flew, until with a loud plop! And a scatter of white spray she bounced out at the top. Now she could see the beach in the distance, and hear the squeaks and squeals of the human-children at play;so that as she drew near them she grew suddenly shy, and plunged down into the shallow water to arrange her hair and wonder what to do. Now 'Erbert was a fat little man with a bowler hat. He wore a draught-board jacket so glaringly bright that it made the seagulls scream with rude laughter,and his shoes were brown and white in patches, like a piebald pony. But what was really important about 'Erbert was his job. He kept a small sideshow in a room like a garage, just above the pier:there you could see the 'Terror of the Arctic' (a moth-eaten polar-bear, stuffed), a 'Dangerous Reptile'(a grass-snake in a bottle),and several other well-worn wonders,all for sixpence. But a real live mermaid was something 'Erbert didn't have,and the moment he saw Esmeralda's sparkling tail he decided to double the entrance-money. He didn't think it would be easy to catch her without a net,and you can imagine his surprise when he found how eager she was to be caught! Quite soon everything was arranged. Esmeralda was to sit in a glass tank and comb her hair all day. It did seem rather odd to her that she had no words to learn,but she thought it best not to argue on her first day as a film-star;and she nodded graciously at the people as she chugged along the sea-front in 'Erbert's battered car. Poor,muddled Esmeralda! She had not been on show five minutes before she wished herself back at the bottom of the sea. Light streamed in from all the lamps and blinded her,and the water was hot and stale and not properly salted:her arms ached from all the combing,and her stiff,cramped tail felt like a great goldfish in a tiny jar. All this she could have borne if she had been admired: but nobody really believed in her. The crowds that poked and peered and pointed at her through the glass all thought she was a fake. They made rude remarks about the colour of her hair and the cut of her tail until she longed to put out her green tongue,and tell them what she thought of their frizzy 'perms' and their ugly, awkward legs. Every day she sat in her stuffy tank and dodged the stale pieces of bun which people would throw in at her; and every day she thought of her little sea-garden with its trees full of tame fishes and its sweet green sea-cucumbers,and wept for home. Poor,poor Esmeralda! How could she escape?